In my last post I talked about the book 'Making Things Right' and in that book the author described an all too often conversation between him and a group of fellow tradespeople. They were at a bar after a week of hard work and were discussing (with vigor) which was better: an Olfa snap-blade knife or a Stanley-style utility knife. I had a chuckle when I read this because I have to say, craftspeople often have these kinds of conversations. In some cases they go way off the deep-end, arguing about what effectively amounts to how many fairies can dance on the head of a pin - I believe they are referred to as forum threads. All that being said, I feel like I need to weigh in on this. 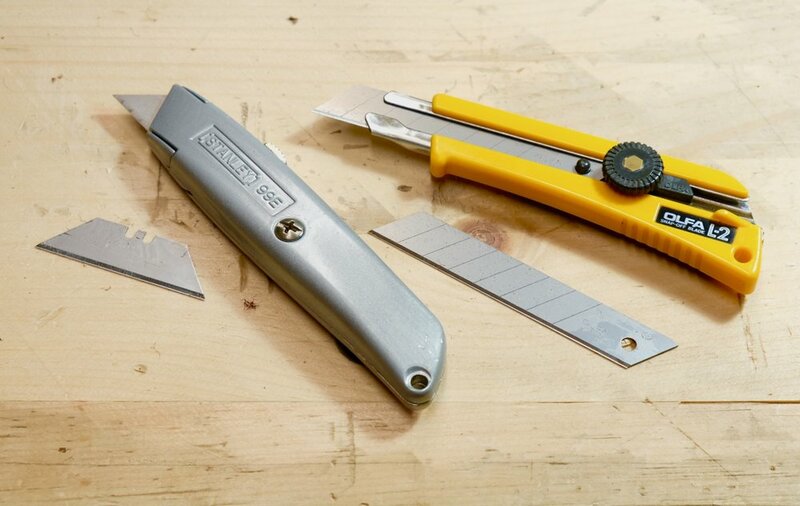 I'm a big fan of the Stanley-type of utility knife. The blades seem to be more stout than the snap-blades so there is less flex to them. This same stoutness also lends them to a few honings before I have to flip them around. Once dull on both sides I've also been known to use them as small card scrapers but that usage is admittedly a bit weak. The most important marketing tool a craftsperson has is doing things well. Whether you are a furniture maker, carpenter or spoon carver, you're really only as good as your last job. Those jobs, done correctly and with care should stand the test of time. Making Things Right - The Simple Philosophy of a Working Life, by Ole Thorstensen is a fantastic book that talks about doing things right, quality and integrity. Ole is a Norwegian Master carpenter and contractor and in his book he takes the reader through the trials of being a one-man show in a world that seems to be flush with big firms. He talks about the impact of doing good work and how in the building world, you get what you pay for. You follow Ole through a job from the bidding process all the way to completion. I found it interesting that a lot of the struggles he mentions in the book are the same struggles I hear from my builder friends here in Canada. You realize pretty quickly that personal relationships and customer service have just as much of an impact as manual skills do. As a woodworker who still does the odd bit of commission work, I definitely identified with Ole through his struggles and his accomplishments when dealing with other humans. The refreshing part of the book for me is Ole's unrelenting commitment to integrity. Integrity is how a person conducts themselves when no one is looking. He serves as a reminder that there are still good, conscientious people in the world who are ever mindful of how their actions will affect others around them. The book is humorous at times and nail-biting in others which for me makes for a great story. I realized quickly that Ole is the kind of guy that I'd like to have a few beers with. I tore through this book over a weekend and have already recommended it to a bunch of friends who work with their hands. East, West, and something in between. Lately I have been doing a lot of research on the Japanese traditions of woodworking. I've always found their methods of work to be interesting and their tools are very different than ours. They pull their saws and planes, their edge tools are laminated steel and some of them work seated on the floor instead of standing at a bench. My curiosity likely won’t have me on the floor woodworking (to be fair, if it did I would likely not get up). Instead, I will likely find some different techniques that I can apply to my own skillset, complimenting my own method of work. For example, I’m really digging pulling planes. It feels (to me) that I have more control of the stroke and I also feel that I have more power when I’m taking heavy shavings. I had a friend come by the shop the other day and he taught me the basics of making a Japanese plane. That was like drinking out of a fire hose. They look deceivingly simple, and how hard could it be? I’ve been making Krenovian-style planes for many years now so how much different could it be? Without going into too much detail, I was wrong. So with that experience fresh in mind, I set out to make a western-style plane that fI could pull. I’m not sure if it’s going to work, which is the case for a lot of things that I try, but I’m giving it a whirl. The glue-up pictured above is the result of a few failed experiments. I have tweaked dimensions and worked with different blades and blade adjustors. I hope this one is the one that bridges the gap between East and West…If not, in the words of Marvin the Martian, “Back to the old drawing board”. There is something surreal about heading back to the place where I studied as a furniture designer and woodworker. Rosewood Studio brings back a lot of memories for me. I spent many hours learning, screwing up, and making mistakes at the school which is probably why it feels weird for me to return as an instructor. I have taught at many places around the globe but this space is different. I cut my teeth here as a woodworker under the tutelage of Ron Barter and continued to learn from him (and others) when I returned as a Craftsman in Residence. Ron and Mary Anne have invited me back on the 9th of April to teach, what I feel, is one of the most important classes they offer. The Excellence with Hand Tools course is where it all begins and for good reason. Students learn fundamental skills like sharpening, basic hand tool use and wood technology. Hands-on skills like creating the ‘Perfect Board’ (a board made 6-square with only planes) and through dovetails are where the week leads, not to mention learning what sharp is and the importance of achieving it. So if you’ve never been to Rosewood Studio or taken a class with me, why not kill two birds with one stone. Or better yet, don’t kill anything and come take the class. As always, a class with me will be a barrel of monkeys and you’re guaranteed to learn, laugh and have a good time.